This necklace measures 20.5 inches clasp to clasp and was inspired by the 3 large coin-shaped stones in turquoise, green, gold and white. Surrounding these beads are 4 caramel-colored lentils. Fully-faceted glass rounds in emerald green finish out the focal beads. 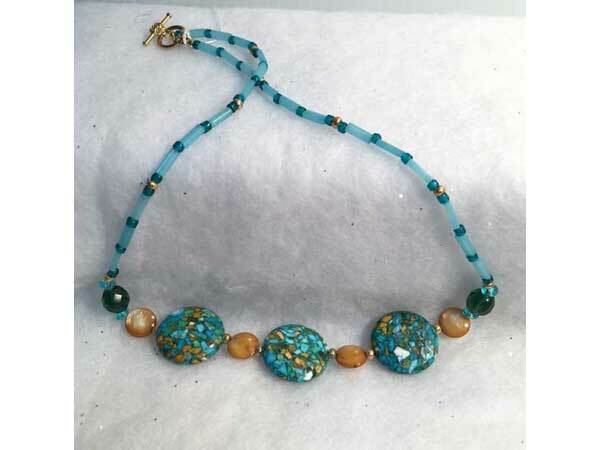 The rest is done in turquoise glass seeds and rectangular tube beads, ending in a gold toggle clasp.